If you’ve studied the American Theater, chances are you’ve heard of Arthur Miller, the King of Kitchen Sink Realism. Trust me when I say, Ivo Van Hove’s A View From The Bridge is not your mother’s Arthur Miller. There isn’t a sink in sight. In fact all unnecessary props, down to certain actor’s shoes, have been eliminated. 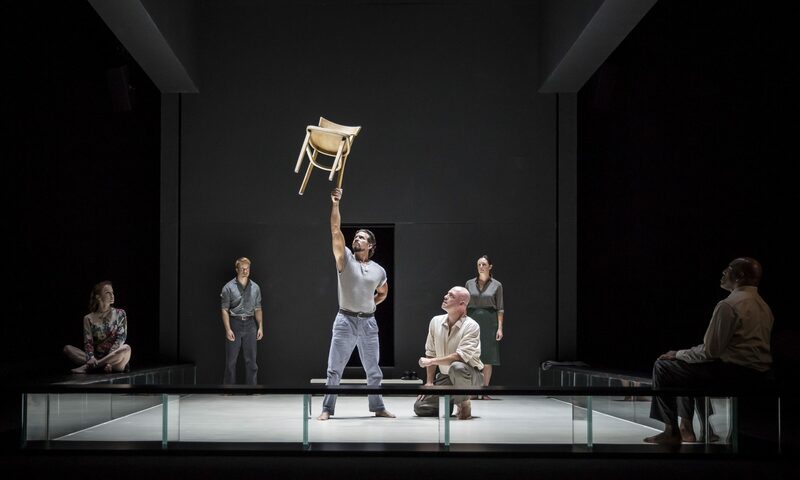 This actor-driven production features a square set with dark-colored benches and a white floor, designed by Jan Versweyveld. Audience sits on either side of the stage, meaning the actors are playing to a house that’s three-quarters in the round. It feels like a boxing ring with only one entrance and exit upstage, which adds to the feeling of being trapped in the space. The opening image reveals Eddie Carbone (Ian Bedford), the patriarch of the family, and his friend Louis (Ronald L. Connor) wiping themselves down with wet towels and getting dressed. Their casual demeanor and act of dressing to me revealed the possibility of a romantic tryst, though it’s never verbally confirmed. During this physical sequence we are introduced to Alfieri (a dynamic Ezra Knight), the neighborhood lawyer who doles out a healthy dose of foreshadowing regarding Eddie Carbone. As the lights shift, Alfieri takes a seat on one of the benches and observes the family scene that unfolds. Catherine Carbone (Catherine Combs) Eddie’s energetic and youthful niece, bounds through the upstage door into the space and jumps into Eddie’s arms, straddling him. An audience member can’t help but notice that Catherine seems fully grown, and even if Eddie was her father this would be an oddly intimate gesture more suited to lovers. This assumption is confirmed when they settle downstage, looking up at Eddie’s wife Beatrice (Andrus Nicholson), as Eddie strokes Catherine’s leg from ankle to thigh. The American-Italian Carbone family has decided to host Beatrice’s two cousins who came into the country illegally to work, Rodolpho (Daniel Abeles) and Marco (Brandon Espinoza). Marco is silent and strong yet empathetic, played by Espinoza with a stoic, graceful, gravitas. Upon seeing the dashing blonde Rodolpho, portrayed by Abeles with the charming fervor of a young dreamer, Catherine dashes offstage and grabs a pair of high heels. A romance begins to bloom, igniting the fear and envy of her Uncle Eddie. A key piece of this journey is the sound design by Tom Gibbons, the Carbone family saga is scored like an epic Greek Tragedy. The dinner scene is a phenomenal collaboration between Van Hove’s direction and Gibbons’ sound. A hollow drum sound echoes between lines and almost inhabits the play as another character, reacting to and preying on their language and their silence. It creates insufferable tension. Beatrice and Catherine also have a well-acted scene about Catherine’s affection for Eddie, where we suddenly see Beatrice might be more of a threat than we had previously assessed. Both women give fantastic performances, dancing the line between their own agendas and supporting Eddie’s fragile white masculinity. As you may know given the popularity of this classic play, a horrendously jealous Eddie Carbone does call immigration on these two innocent immigrants, all for the “crime” of daring to love someone he thought of (rather unhealthily) as “his.” In a manner I will keep secret for those who have not seen Van Hove’s genius interpretation of this moment, Carbone meets a bloody end. His tune has completely changed from the welcoming man who believes in giving everyone a fair chance. Once Eddie realizes he cannot control these men, that they are autonomous human beings who want to build a life, he turns on them in the ugliest of ways. The crux of this story is, as the title of the review states, the consequences of Carbone’s fake allyship. You cannot pretend to want the world for your fellow man, and then take it away, without severe social and physical consequences. A harrowingly relevant production of this classic for 2017. BIAS ALERT: I love Arthur Miller’s work, and surrealist takes on classic plays.